A workhouse existed in the 1720s at Rowell (or Rothwell) but was absent from the 1776 parliamentary survey which listed parish workhouses in operation in Broughton (10), Geddington (14), Kettering (80), Great Oakley (18), Rushton—St Peter's and All Saints (20), and Stanion (20). County of Northampton: Barton Seagrave, Broughton, Burton Latimer (2), Corby, Cottingham, Cranford St Andrew, Cranford St John, Cransley, Desborough (2), East Carlton, Geddington, Glendon, Grafton Underwood, Harrington, Kettering (4), Loddington, Middleton, Newton, Great Oakley, Little Oakley, Orton, Pytchley, Rothwell (2), Rushton, Stanion, Thorpe Malsor, Warkton, Weekley. Later Additions: Barford (from 1862), Beanfield Lawns (from 1863), Great Weldon (from 1896), Little Weldon (from 1896). The population falling within the (original) Union at the 1831 census had been 15,464 with parishes ranging in size from Glendon (population 44) to Kettering itself (4,099). The average annual poor-rate expenditure for the period 1833-5 had been £15,754 or £1.0s.4½d. per head of the population. Kettering Union workhouse, built in 1837-8 to designs by George Gilbert Scott who was the architect of many other workhouse buildings including ones for the nearby Northampton and Oundle Unions. The Poor Law Commissioners authorised an expenditure of £5,000 on construction of the building which was intended to accommodate up to 250 inmates. The design was based on the model cruciform plan published by the Commissioners in 1835. The site location and layout are shown on the 1926 map, by which time the workhouse was officially known as Kettering Poor Law Institution. The entrance range at the west contained the porter's lodge, board-room, offices and so on. Kettering general view from the west, 2000. The central part of the entrance block was originally three storeys high but has now been reduced to one. 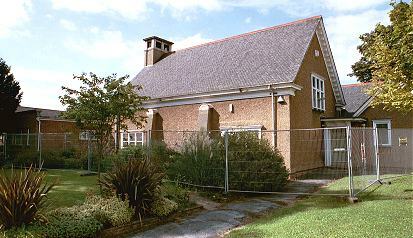 Kettering entrance block from the south-west, 2000. To the rear, radiating from the central supervisory hub, were four accommodation wings for the various classes of inmate (male/female, infirm/able-bodied etc.). In the mid 1890s, an infirmary was added at the east of the workhouse. Kettering workhouse east wing and infirmary, 2000. In about 1895, a laundry was added at the north of the workhouse, and a vagrants' block at the south-east. A building at the north-west of the workhouse dated 1909 may have contained a Guardians' board-room. 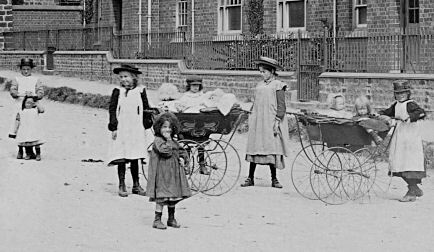 From 1904, to protect them from disadvantage in later life, the birth certificates for those born in the workhouse gave its address just as 77 London Road, Kettering. 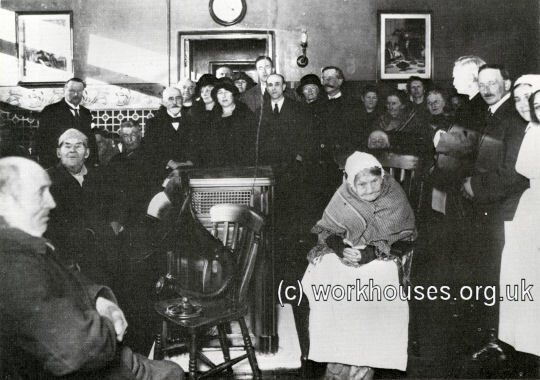 In the 1920s, a wireless set was installed at the workhouse. 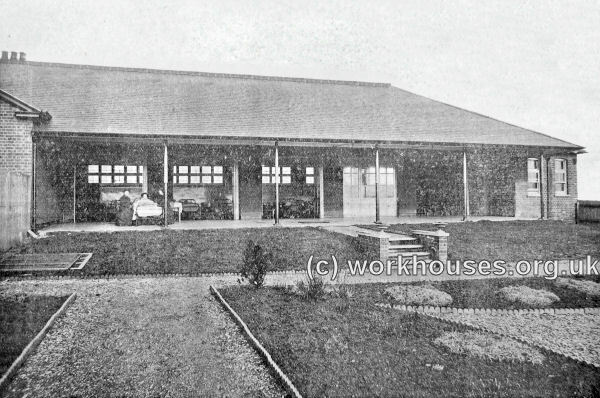 Kettering workhouse's first wireless set, 1920s. Between 1935 and 1960, the former workhouse was known as St Helen's Hospital. Many of the original workhouse buildings still survive on the site which has now become St Mary's Hospital. In 1896-7, the Kettering Union established a cottage home on the High Street at Burton Latimer. 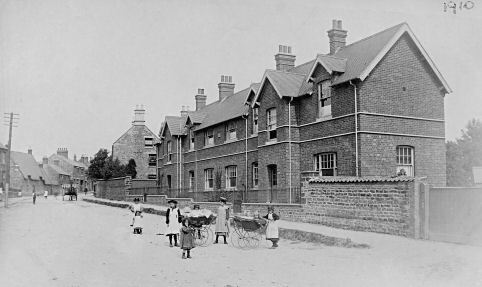 The homes were intended to provide accommodation for around 30 boys and girls in rural surroundings away from the influence of the main workhouse. The original home, now known as 159 High Street, was originally a farmhouse dating from the 1700s. It was purchased from the Hon. Mrs. Vernon at a cost of £1,250 and alterations were carried out to make it suitable for its new function. Its location is shown on the 1900 map below. Burton Latimer cottage homes site, 1900. 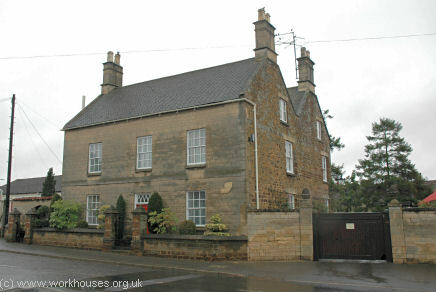 Burton Latimer Cottage Homes — original building, 2005. The accommodation was expanded in 1901 by the construction of a new building to the south, now 163-165 High Street, at a cost of £1,715. A total of 68 boys and girls were then accommodated. A single storey building behind the main building was used as a sanatorium for children with infectious diseases. Burton Latimer cottage homes site, 1926. Burton Latimer Cottage Homes, 1910. © The Burton Latimer Heritage Society Archive. 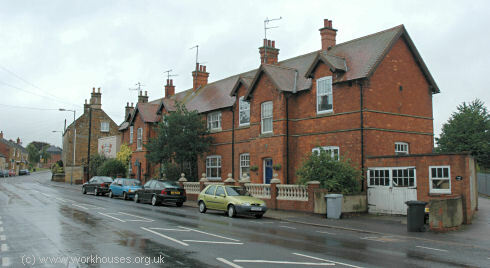 Burton Latimer Cottage Homes — 1901 extension, 2005. The old home closed in 1920, and the newer building in 1922. Both are now used as private residential accommodation. In 1904, the union erected a small hospital for the open-air treatment of phthisis, or tuberculosis (TB) of the lungs. Designed by Messs. Gotch and Saunders, it was located about fifty yards from the main infirmary block and housed ten male and ten female patients. There was an open verandah in front of each ward onto which beds could be wheeled. Between the verandah and the sleeping wards were sliding panels allowing the whole building to be thrown open. The hospital faced south and had about three acres of open ground in front of it. Kettering Union TB Hospital, women's ward from the south, 1908. Northamptonshire Record Office, Wootton Hall Park, Northampton, Northants, NN4 8BQ. A wide variety of records survives including: Guardians' minutes (1836-9, 1863-1930); Births register (1893-1912); Deaths register (1893-1914); Admissions and discharges (1907-8, 1911-31); etc. Burton Latimer Heritage Society — extensive web page on the cottage homes by John Peck. Thanks to John Meads and Burton Latimer Heritage Society for cottage homes information and photo.